Advanced Science Beyond Temporary Relief! exoFlex is the world's first liquid liposomal encapsulated joint health supplement utilizing eggshell membrane! When it comes to choosing a natural joint health supplement, providing quick and efficient support can be more important than dosage size. exoFlex is a powerful formulation of synergistic nutrients and antioxidants encapsulated into all-natural lipospheres. These incredible nano-sized liposomes protect the exoFlex formula, helping to facilitate a more efficient transition through the enzymes of the body's digestive system as they make their way into the bloodstream. Major causes of joint discomfort can include the breakdown of cartilage due to strenuous athletic training, sports-related injury, and age-associated joint deterioration and inflammation. exoFlex works by providing Biova's proprietary eggshell membrane 'BiovaFlex', coupled with key nutrients and antioxidants to aid in neutralizing and decreasing free radical damage. 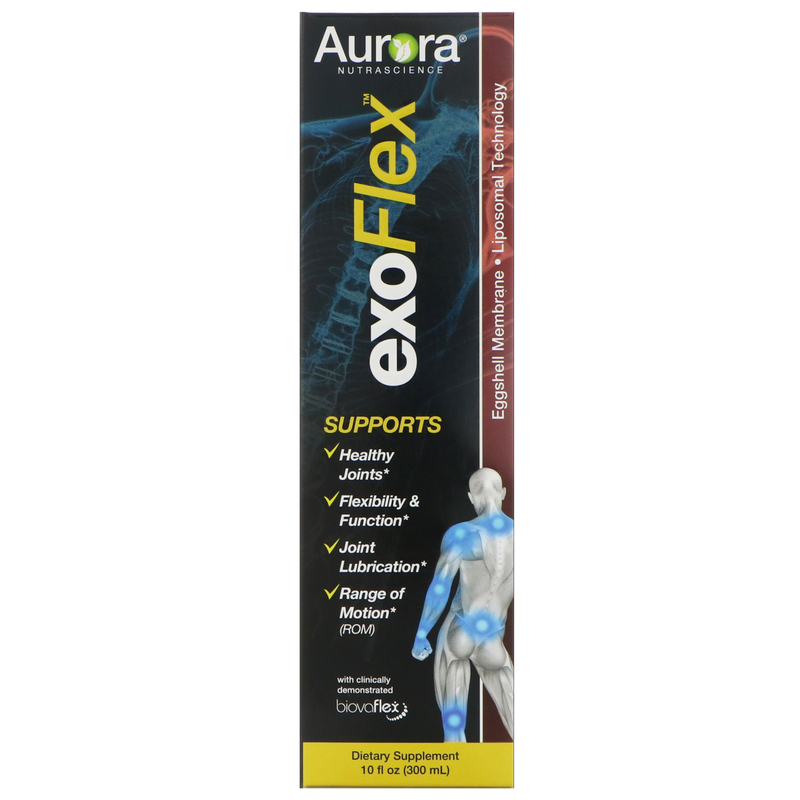 exoFlex supports the body by helping to create the essential building blocks required to support essential joint and connective tissue health. As a dietary supplement, take 2 teaspoons (10 ml) or as directed by your healthcare professional. Shake well before each use. Take on empty stomach. Drink straight or mix with cold water, juice or yogurt. Do not machine blend. 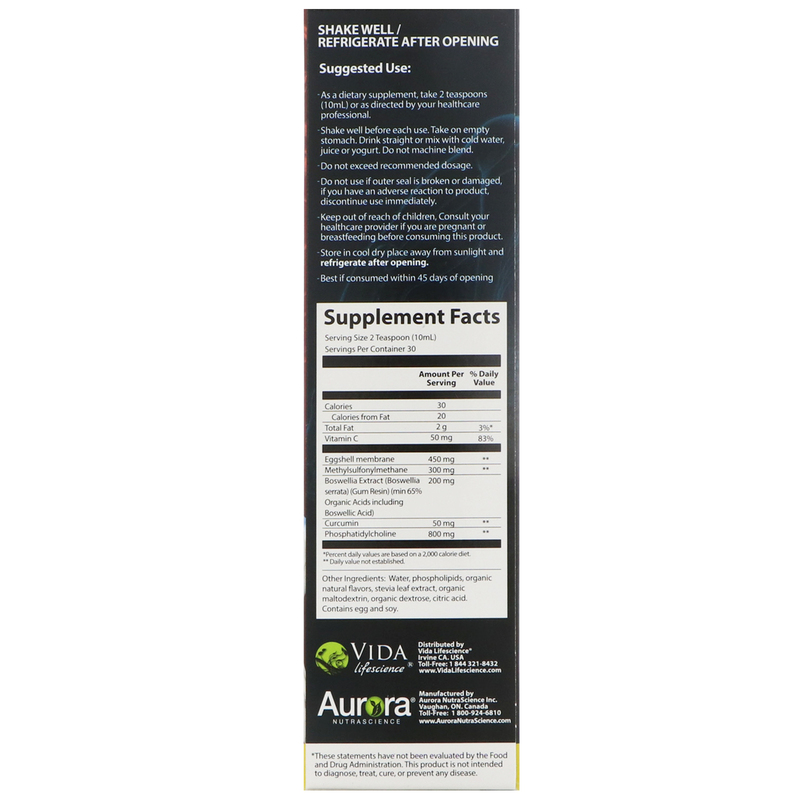 Water, phospholipids, organic natural flavors, stevia leaf extract, organic maltodextrin, organic dextrose, citric acid. Do not use if outer seal is broken or damaged, if you have an adverse reaction to product, discontinue use immediately. Store in cool dry place away from sunlight and refrigerate after opening.